simultaneously add a sophisticate touch to school uniforms, tuxedos, or ring bearer outfits. (1) Material : 70% Polyester + 30 Elastic. (2) Heavy duty solid metal clip closure. " Y shape and 4 clips". (1) Heavy duty solid metal clip closure. (2) Suspenders are adjustable and stretch to conform comfortably to you and your baby body! (3) Width 0.98 Inch, available in 4 sizes to fit all ages and genders from 7 months up to 9 feet tall. 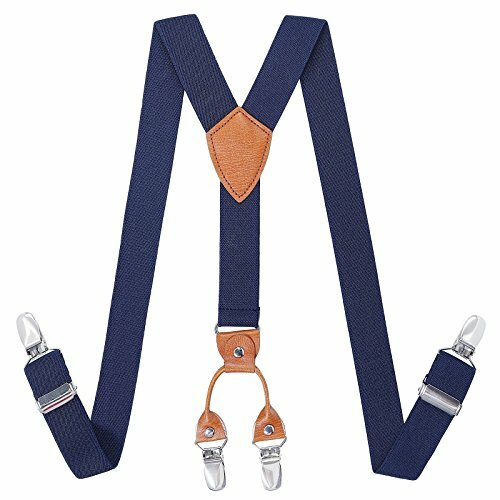 (4) Good quality classic suspenders are ideal for any occasion like birthdays ,weddings, parties, and more special occasions etc. Navy Blue & White Stripes suspenders, Bare Pink & White Stripes suspenders, Wine Red suspenders, Black suspenders, Red suspenders, Coffee suspenders. A lot of size and color can make adults and children to choose their favorite! 3. NOTE: The real color of the item may be slightly different from the pictures shown on website caused by many factors, such as brightness of your monitor and light brightness. If you have any questions about this product by Kajeer, contact us by completing and submitting the form below. If you are looking for a specif part number, please include it with your message.